Sigma is revising their DP compact camera lineup. While the lenses don't really change (19mm, 30mm, and 50mm), the design of the camera does and so does the sensor. Let's look at each change individually. Yep, there's a button/controller (and a dial up top) you might want to access with that thumb, and then what happens? You have no real grip on the camera. That Mode button up top requires you use another control to make a setting. So which fingers are you using to do all that, and which are left holding what part of the camera? Meanwhile, we have a lot of empty real estate on the back of the camera, enough so that we can stack written identifiers to the left of the rear LCD and space out all the buttons. I'm not entirely sure what the goal of the design was (Sigma says "intuitive" and "balance"). I suppose I should reserve judgment until I've held and used the camera, but on first examination, these new camera designs seem more design over function. 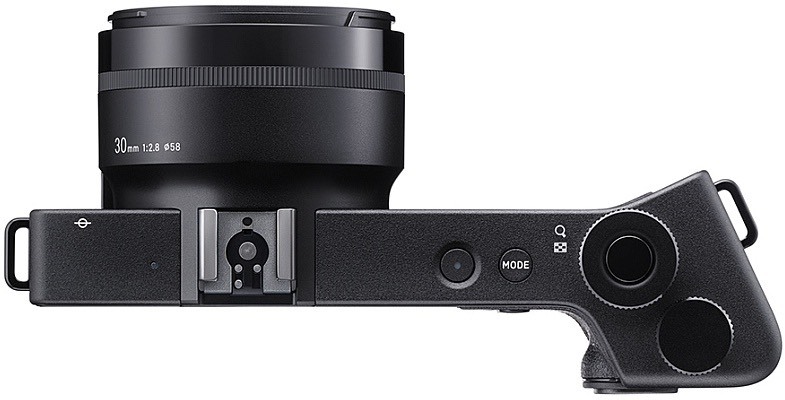 Or maybe Sigma wants everyone to start holding their cameras with their left hand under the lens again. More curious is that Sigma has changed the Foveon sensor arrangement, and that's going to take some shooting to figure out what we gained and lost. In the old Foveon sensor design, every photosite sensed blue in the top layer, green in the middle layer, and red in the bottom layer. Every photosite provided a full RGB data set that was unique. The result was very high acuity, no color moire, but poor high ISO capability. In the new arrangement, only the top layer has full resolution. The layers below are grouped to form a single color detection for four of the top layer photosites. In other words, the top luminosity/blue layer is 19.6mp, while the luminosity/yellow and luminosity/magenta layers are 4.9mp. On paper, this seems like a "between Foveon and Bayer" compromise. What the original Foveon sensor had as an advantage was a high degree of acuity, partly because no AA filter was necessary. What Bayer had going for it was an emphasis on green, which is where most of our luminance discrimination is, and because of that a tendency towards lower noise, all else equal. Each layer also introduces a noise factor in Foveon. By reducing the circuitry in the lower layers, there should be some heat/pattern noise advantages for the new design, too. So what do we expect? We expect the new sensor design to have less noise. Though given that the stated ISO range is 100 to 6400, I'm not expecting a huge gain there from current technology. From there it gets dicey, because essentially now we need a "demosaic" engine, and that's going to potentially introduce issues that impact resolution and acuity (though perhaps not by as much as most folk think, as there is "dispersion" in the lower layers to start with; remember, the focus plane is infinitely thin, not three-layers thick ;~). Bayer is highly refined in demosaic these days, but here's Sigma taking on a new demosaic from scratch. That's going to mean that all the raw converter folk are going to have to, too. Sigma didn't have much third party support to start with, and given their low volumes and yet another sensor pattern, I don't think we're going to see that get better. Update: after talking to several folks intimately familiar with the Foveon sensor, I believe we can say the following. First, while everyone, including Sigma, keeps trying to use the RGB nomenclature, the Sigma sensor is most certainly not RGB. It's more like a luminosity layer at top (with a color bias), and then color difference layers below. It's much more similar to Lab Color than RGB color. Second, a number of factors start to come into play with the current sensor, including diffraction into the lower layers and even reflections between layers. As it was, some advanced Foveon aficionados were already using averaging or blurring techniques on the lower layers to "smooth" them. In essence, that's what the new sensor design does in hardware. Apparently, this was an approach that Foveon themselves had considered at one time. The expected gain from this approach is likely a greater than 1 stop but less than 2 stop gain in ISO performance without any real impact on acuity. Given the 14-bit change (from 12-bit) and some other changes in how the signal is processed, we might see a 2-stop gain, which means most folk would find ISO 800 acceptable. Too bad Sigma's marketing wants to get into technical discussions that are wrong instead of just saying the obvious. For example, they could have just said "the new approach is usable in X stops less light without sacrificing the high acuity of the Foveon sensor. Coupled with other changes we've made, the new DP's will be usable in more conditions, operate faster, and yet not give up any of their resolution advantage over Bayer designs with the same number of pixels." Come on people, how hard is to come up with cogent, short, and understandable marketing statements? Did they stop teaching benefits driven marketing sometime in my 40+ year career? For Sigma's full description of the new cameras, see their worldwide site (the US site has limited information still).